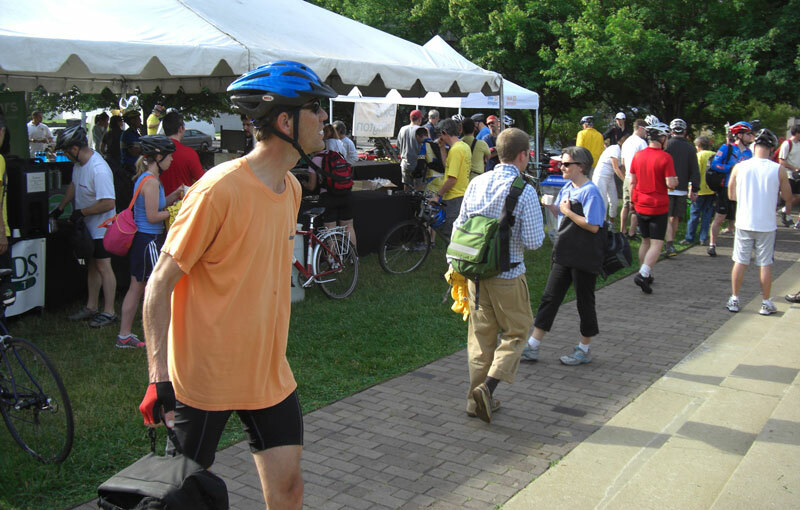 Over 8500 cyclists were registered for today's Bike to Work Day. 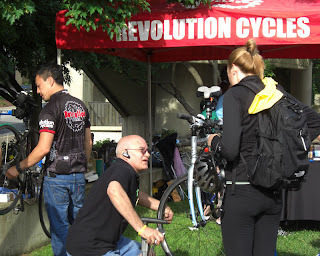 At the Rosslyn pit stop in Gateway Park, legendary Revolution Cycles mechanics David and Pinky were providing cyclists with adjustments and tune-ups. Volunteers were there handing out Bike Arlington light bags, water bottles, bike bells, and information about bicycle commuting and local bike events. Bike DC, the Washington and Arlington community bike ride, is coming up this Sunday. If you have some lame excuse for not riding your bike to work, well, hey, you probably don't have to work on Sunday. Go Bike DC! In other local bike news, DC and Arlington have announced a regional bike-sharing program that will encompass 1100 bikes available from 114 stations. It will be the largest bike-sharing program in the U.S. Maybe you would prefer to sit in your car, stranded in traffic, while waiting to get to your destination and hunt for a parking space. But cycling is becoming fashionable. Don't you want to be fashionable? Update: Vote for the name of the bike sharing system.